Every Saturday, my husband Mark and I traditionally wake up and cook a large breakfast, which usually consists of some form of eggs, bacon, wheat toast, coffee (our favorite is KC Coffee), and Tropicana Pure Premium orange juice, No Pulp, Calcium + Vitamin D (which is my pick, Mark indulges my persnickety approach to orange juice. I hate pulp!). One Saturday in November I decided to try something a little different. I made scrambled eggs with leeks, a recipe pulled from a book called Energy Food: Energy-Giving Food Solutions to Keep You Fully Charged Throughout the Day, by Beverly le Blanc. I found this book grocery shopping and bought it because I thought it might help me eat foods to keep the hypoglycemia under control. I have what is called mild hypoglycemia. When I eat foods that are high in protein and whole grains, I don’t feel jittery, sweaty, cranky, and clammy. This book is not specifically written for people with hypoglycemia, but it’s the best cookbook I’ve seen to help incorporate foods to keep my blood sugar steady. Here’s the recipe for Scrambled Eggs With Leeks. It’s simple, delicious, and filling. Put the eggs in a bowl and use a fork to whisk together until blended, then set aside. Heat the oil with half the butter in a large skillet over a medium-high heat until frothy. Reduce the hear to medium, add the leeks, and stir around for about 5 minutes until wilted. Use a slotted spoon to remove the leeks from the skillet and set aside. Add the remaining butter to the oil in the skillet. Season the eggs to taste with salt and pepper, then pour them into the skillet, reduce the heat to medium-low, and cook, stirring, for 1-1/2 minutes, or until the eggs begin to set. Return the leeks to the skillet and stir into the eggs until the eggs have reached the desired consistency. 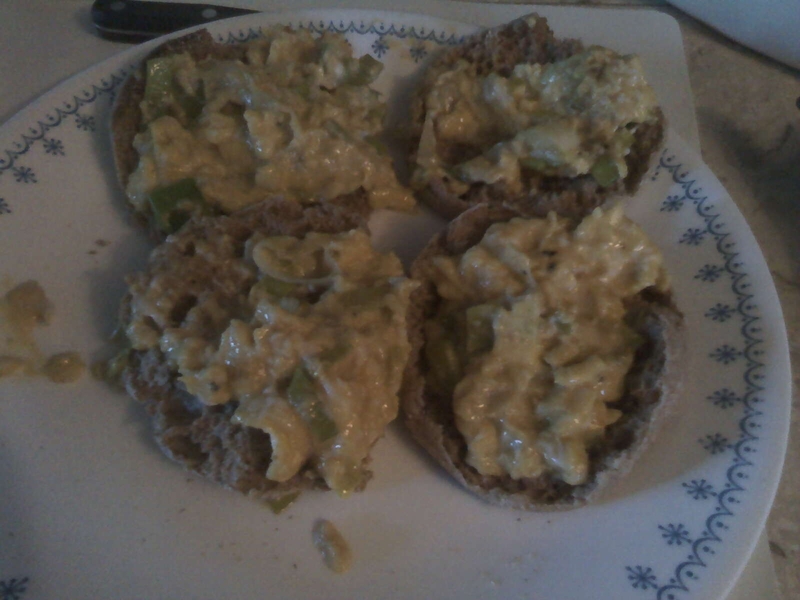 Spoon the eggs and leek mixture over the hot muffins and serve. If you try this recipe, I invite you to tell me your thoughts! If you have your own Saturday traditions or breakfast recipes, please share those too! Happy Saturday, everyone! I’m off to make some breakfast. this sounds delicious! thanks for sharing the recipe & benton! i have an amazing, yet simple, potato leek soup that i will get back on here & share. Hi Jenny! Thanks for reading and commenting! We had a good laugh over Benton. I think I've had your potato leek soup, and it was delicious! Looking forward to your recipe, thanks for sharing!